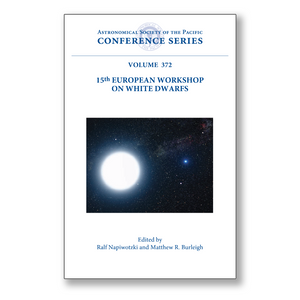 These are the proceedings of the 15th European Workshop on White Dwarfs, held at the University of Leicester, UK, from August 7th-11th 2006. The series was started by Prof. Volker Weidemann at the University of Kiel, Germany, in 1974 and has since developed into the most important meeting on this topic worldwide. The 15th Workshop attracted the largest number of participants of the series so far: 131 delegates form 20 nations and 6 continents, and was sponsored in part by the Royal Astronomical Society. White dwarf stars are of significant importance to many fields of modern astrophysics. The sessions at the 15th Workshop reflected these synergies, as well as focusing on the traditional areas of interest in the stars themselves: white dwarf structure and evolution, mass distribution and luminosity function; white dwarfs in stellar clusters and the Galactic Halo; their atmospheres and magnetic fields; white dwarfs in binaries; and variable white dwarfs. At this meeting a new session was introduced focusing on the role of white dwarfs as progenitors of Type Ia supernovae, with their important implications for contemporary cosmology, and another new session was dedicated to the recent discoveries of dust disks around white dwarfs and the current searches for planetary-mass companions to these stars. These proceedings provide a snapshot of current research in white dwarfs, and are suitable for researchers and graduate students studying these important stars.